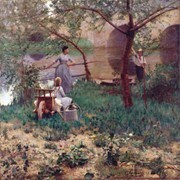 Guide to Painting in Ireland and by Irish Painters Abroad. The nineteenth century was a period of transition in the history of Irish art. The establishment of the Royal Hibernian Academy (RHA) in 1823, and the expansion of other cultural institutions like the Royal Dublin Society (founded 1731) and the Royal Irish Academy (founded 1785), helped to stimulate the fine art infrastructure in Ireland, especially for Irish painting. Even so, patronage was scarce and London - with its vastly larger art market, its art studios and career potential - was still the Mecca for talented Irish artists. Thus while there were signs of a newly emerging indigenous Irish art market, Britain and the Continent continued to exert significant influence on its patronage and style. The formation of the RHA, through the amalgamation of numerous artists groups was a key element in nineteenth century Irish art. Its annual exhibitions provided a reliable showcase for its successful exhibitors, a source of income for its members, and stimulated debate on cultural and painting issues. 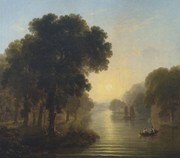 A new tradition of landscape painting emerged, led by James Arthur OConnor (1792-1841), himself influenced by seventeenth century Dutch engravers. Other noted nineteenth century Irish artists included the history painters James Barry (1741-1806) and Daniel Maclise (1806-70), the landscape artists George Chinnery (1774-1852), William Sadler (1782-1839), Cecilia Campbell (1791-1857), Henry ONeill (1798-1880), Edward Hayes (1797-1864), who painted in oils as well as watercolour and gouache, John Henry Campbell (1757-1828), George Barret Junior (1767-1842) and William Louis Beaufort (1771-1849). In addition, there were the genre-painters Joseph Patrick Haverty (17941864) and James Brenan (1837-1907); the marine artist George Mounsey Atkinson, the landscapists Nathaniel Hone The Younger (1831-1917), John Faulkner (1835-1894) and Augustus Nicholas Burke (1838-1891); the portraitist John Butler Yeats (1839-1922) and the rural life artist Stanhope Alexander Forbes (1857-1947). Foremost in Irish sculpture during the nineteenth century, were John Foley (1818-74), John Lawlor (1820-1901) and Samuel Lynn (1834-76), all of whom collaborated with English sculptors on the Albert Memorial in London. Despite this growth in painting and sculpture, very many talented Irish artists achieved most of their fame outside Ireland.This trend of Irish artists working abroad continued during the second half of the nineteenth century, following the terrible years of the Famine. After attending art school in Ireland, numerous artists furthered their studies at academies in Antwerp or Paris, and some - like Walter Osborne (18591903), Roderic O'Conor (18601940) and Norman Garstin (1847-1926) - spent long periods abroad absorbing the plein-air painting methods of the Impressionists and other styles of French art. In contrast, painters like the Irish portraitist John Lavery (1856-1941) went to London to establish his career before returning to Ireland, as did William Orpen (1878-1931). However, nationalist Dublin was gradually starting to become a more attractive venue for Irish art. Thus we see a steady trickle of artists returning from London or the Continent to pursue their careers in Ireland. Examples include the genre painter Richard Moynan (1856-1906), the romantic Expressionist Jack B Yeats (1871-1957) and Paul Henry (1876-1958), who, after studying in Paris and London, returned to Ireland and was so captivated by the country and his Irish identity that he stayed to become its leading landscape artist. Even William Orpen, who remained in London to develop his portrait business, returned regularly to teach at the Dublin Metropolitan School of Art, influencing the next generation of Irish painters, like Sean Keating, James Sleator and Leo Whelan, in the process. Dublin's growing appeal applied to sculptors as well as painters. The Irish sculptor John Foley completed memorials to Oliver Goldsmith and Edmund Burke in Trinity College Dublin, as well as the memorial to Daniel OConnell in OConnell Street, Dublin. By the end of the nineteenth century, the lure of overseas studios and patrons of arts began to abate. A new generation of Irish painters, ranging from the politically committed to the politically indifferent, began to emerge, who would make Ireland the focus of their careers. This is explained in Twentieth century Irish art.  For more about the history of Irish culture, see: Visual Arts in Ireland.  For details of 19th century painting and sculpture in Ireland, see: Irish Art Guide.  For information about the cultural history of Victorian Ireland, see: Homepage.